absolutely ready for a trip. la lengua sliced, yum! just what I was looking for. as when my mom cooked it at home, good memories! also, the ham and cheese gordita would be perfect for my little boy, who’s picky about spices and no sauce. how’s the pricing? do they run on cash only or cards accepted? To be honest, we didn’t make note of the prices (and I’m not sure if all of the prices were posted). Everything above, plus two bottled sodas cost $14. That seems in line with most trucks. We didn’t specifically ask about credit, but its safe to assume that cash is the way to go. Have you guys seen the one on W. Broad about a block south of Hague? It is definitely new to us, but we were driving by too fast for me to catch the name. Also, in slightly unrelated news – Smokin’ Joes BBQ. Now that the fib festival season is pretty much over, they’re going to be setting up in the parking lot of the gas station at James Rd & Broad St (right next to where Sammy’s used to be) every Friday, Saturday and Sunday with the meat getting done around noonish. It wasn’t quite ready when we stopped by, but we’re planning on going back tomorrow to get some. Just thought I’d give you guys a heads up so you can keep your eye out for it. I want to go to Broad and Harris so they can slip me some thick tongue! First slabbed tongue I’ve seen from a Columbus taco truck – usually strips or cubes. Wonderful taco truck! Very fresh, delicious and great service. The chorizo is great and the tongue is excellent. They are on Sullivant (by Binns near Koki’s tortillas), not Broad street. I hope this website can be updated soon to reflect that. Like others have said, this is a great truck. We had a chorizo torta along with lengua and zazonada tacos. 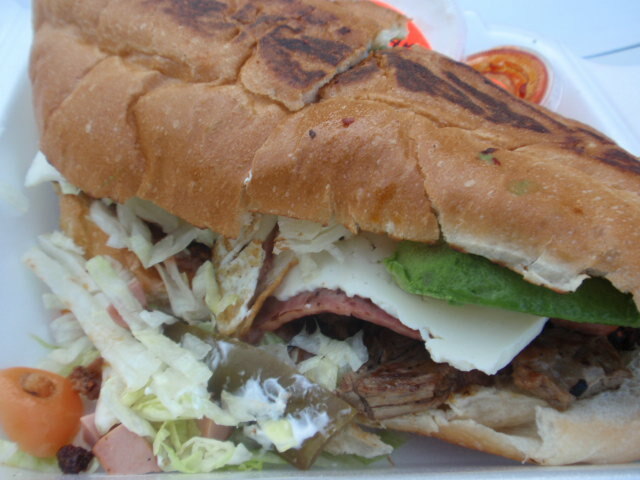 The torta compares very well to the best item I’ve eaten at any truck (campenchano burrito at Taco Nazo). They have moved. Now over at 3160 East Main Street. Since they are near me I had to try them out. WOW! I am happy they are only 2 miles away! Jealous! I’m sad they moved to the east side, but I’m happy they are still in business.